Breaking In. Samuel Goldwyn Company 1989. This is a comedy about safe cracker mentoring. When I think of safe crackers, I think of No Deposit No Return, and there’s room for similar cracking hijinks, but beyond that, I have little to go on. I don’t know what to expect in terms of performances because it’s Burt Reynolds playing an older man but not his reputation “self” and an actor I think I only know because he was part of a gang in one of the Back to the Future movies. 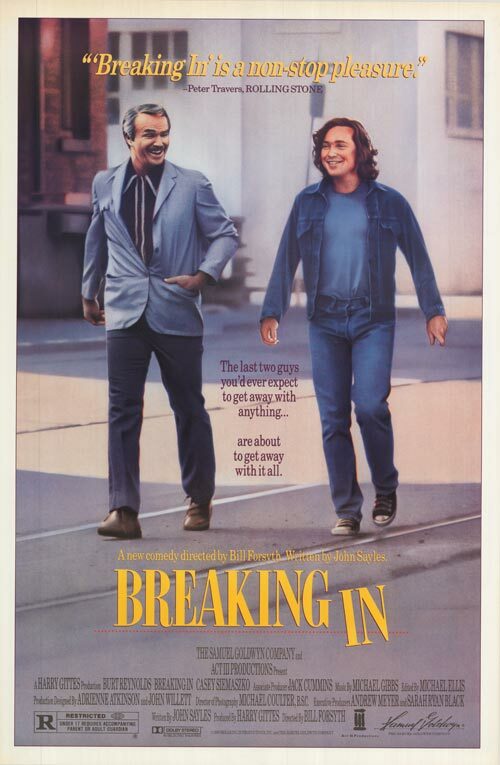 This movie was made in 1989, but doesn’t this poster look more late 70s/early 80s? Maybe I don’t have as good of a feel on poster styles as I thought. One evening Mike, a young recreational burglar, happens to hit the same house that Ernie, a seasoned professional safecracker, is working. Ernie takes the young man under his wing and teaches him the trade. They hit a few places together, but while Mike is mostly diligent in learning how to get the money, his youthful arrogance overrides Ernie’s advice on how to handle it. What sells this movie is the performances of the leads. Mike’s arrogance and insecurity juxtaposes well with Ernie’s wisdom and vulnerability. Most of the humor comes from Ernie, and even then it’s low key. The most fun in the movie was the scene where they crack the Cannonball safe. One major event in the film is that Mike casually gets himself fired from his job working with tires over an argument with his boss about whether he should help an important customer immediately, or after his last ten minutes of lunch. This stuck with me because yes, he was a little smart-mouthed about it, and yes, labor laws vary by area and the film was made over 20 years ago, but a smarter use of his ill-gotten wealth, instead of getting thrown out of Ernie’s house for carelessness and moving into a penthouse apartment, would be to sue his boss for wrongful termination, perhaps with a lawyer supplied by “rich uncle Ernie”. This movie wasn’t very funny, wasn’t very dull, wasn’t very happy, and wasn’t very tragic. Overall, it just wasn’t very. Watch this movie: as a story of mentoring and mistakes learned from. Don’t watch this movie: for big laughs.